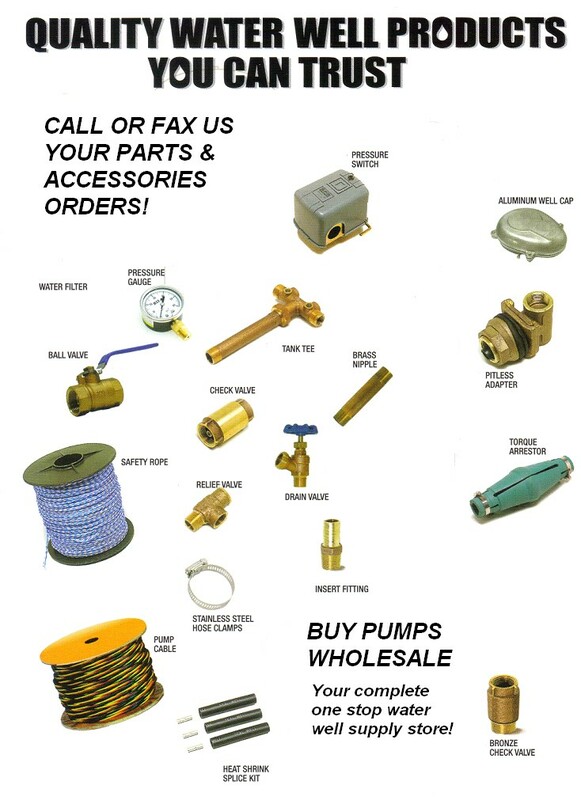 Submerisible pump accessories & parts needed to perform a proper professional water well pump system insallation and provide years of trouble free service. BuyPumpsWholesale.com has a program for our customers that will include a group of products that will be UPS shippable and/or can be picked up at our warehouse...and another group that will be available for warehouse pickup and/or motor freight shipments. These products are UPS shippable and can be ordered by phone or fax. The UPS freight will be calculated and known to our customers before we will ship or process a customer's credit card. These parts could also be ordered as warehouse pickup. Products can be ordered from this group by phone or fax for warehouse pickup or they can be shipped by motor freight to our customers. We prefer that our customers know freight costs before the sale on accessories is final.